This is me, bawling my eyes out. Except it's Shepherd. Well. I’m giving myself a little grace for not getting my article out last week. 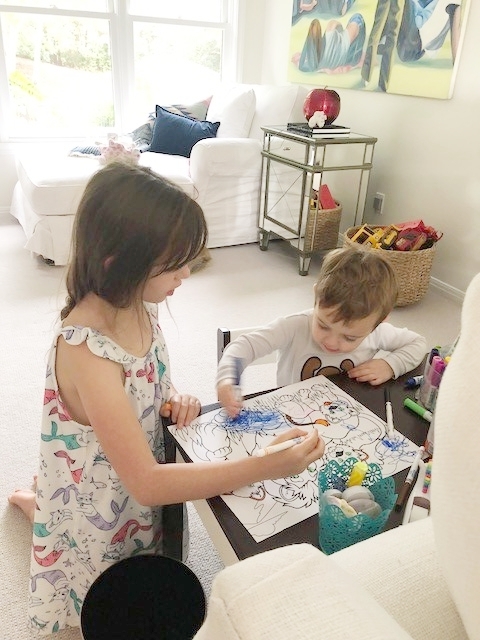 With the complete mess and upheaval of painting the entire house while living in it, having to stay at a hotel on a school night after finding out at 5PM that the kids rooms were not sleep-able, etc., etc.…it’s been a little stressful to say the least. The hotel ended up being one of the highlights of our week. So cozy at The Hotel Granduca. And I ordered room service for three meals in a row. Yup, that’s right, I did. HA. That, combined with all the changes, I totally cried harder in a week than I have in recent memory. But I am so pleased to announce that we had a normal weekend with hardly any construction workers and only one GIANT tarantula. If you follow on my Insta, you may have seen that we found a tarantula on the outside of the house and the electricians who were here were all "ah, leave it, it'll take care of the mice!" So obv we left it, cause ain't nobody want to mess with the Big T. So la di da, we went on with our day and Matt and I went out for a date, came home, and as Matt was turning off lights around the house, he noticed the TARANTULA in our laundry room. I die. Anyway, this article isn't about the unexpected horse-of-a-spider, but let's just say Matt golfed for the first time with a broom and a tarantula. All of the neighbors say they've never seen one before, so we were the, cough, lucky ones. Anyway, at the risk of over-writing about our home and the move, it's been basically completely consuming for us to get our new house to a comfortable place of 'new normal' which I feel like is essential for me with our three little ones. It's coming together, and I'm sort of looking at it as a 'rolling done-ness'. We have wires hanging out of the walls waiting for our updated switches and plugs, we have upcoming construction in the “mold room” and fireplaces to be redone, but what is finished is turning out beautifully. We have one totally finished room! Baby gate and artwork up! Hooray! First dip in the pool! She had pink for six years, and it was so cute to let her pick exactly what she wanted. Loving this light from RH. Ahh I've been dreaming about this chandelier! We painted everything white and are changing the hardware and sinks to gold. Click link to see. 1. Scarlet's b-day. AHH, she’s turning 8! Holy moly, this feels like a big one. She’s such a well-rounded little human and she has adjusted so well to all the newness. We’re having two families over for lazer tag, dinner and an ice cream bar, and an outdoor movie, all per her request. I think it’s sweet she wanted to keep it small. She is unabashedly herself, and I’m so proud of her. 2. Matt and I have both lost weight since being here and are both back at the weight we were at our wedding. For me that was like five pounds and for him, I’m not quite sure…but I like to be accepting of my body for being my body — healthy and strong, and not a certain size per se, though I have to admit, it does feel pretty amazing to be at my wedding weight. Funny how when you’re super busy and ‘what you’re going to eat’ isn’t at the front of mind, it’s a little easier to skip snacking and just do healthy meals. That’s what works for me, and I’m feeling good about that, with a mindset of ‘wellness’. I’ve also been running almost every day because it helps me with anxiety and the loop I’ve been running by the lake is so beautiful, I can’t get enough of it. 3. Oh man, five is/was a tough age for my big kids. Sterling is in it right now and while he’s getting awards for “best listener” at school, he’s ahem, not getting that award at home. In fact, the opposite. He’s tantrum-y and I’m sure it’s the move + kindergarten + his age. But I came across a mantra that has helped me so much. When he’s struggling or whatever, I tell him “I can handle all of you”. It helps him, it helps me. I can handle (and love/accept) all of him. Testing the boundaries is one of the jobs a kid has. And it’s my job to help them through it, even when its challenging. I like to be a silly and encouraging parent, but I’m also strict on manners and respect, so getting that happy medium when a kid is going through something is a delicate balance. Reminding myself I can “handle all of him” in a way that will help him move forward? That’s my goal. I read Chip Gaines’ article in their magazine and he said something so beautiful. He said he thinks of his children like arrows. He sees it as his job to sharpen them and to ready them to be sent out into this world — to be ready for all of it. I resonate with that a lot. All of my children are different and when I step back and see their individuality and think of how I can best prepare them to shine their light bright in this world and overcome their unforeseen obstacles? Yes. That’s it for me. I’d love to hear some of your experiences with major life changes! XOXO!